When going to the nail salon most of us go for a manicure or tips. For me most of the time it's for tips, but after a while I get really tired of them. When the time comes for me to take them off, it becomes a difficult challenge. So whenever I want to go and get them done professionally I usually let my own nails grow. Then when it's time for me to go I just ask them to put acrylic on them instead of tips and the acrylic. The acrylic is like a protective shield for your nails. But after a while I become tired of it, but this time the process was much easier to take them off. If you're like me, you want tips when you don't have them and when you do, you want them off. Am I making sense? So for the past month, I decided to solve my nail problems completely. I will grow my nails and take care of them. I also decided to invest in a nail hardener, because it seemed like every time I bumped into something really hard they would break. That's when I found and brought a nail hardener from Walmart! The Nutra Nail: Flex Shield Nail Hardener helps soft, thin, and weak nails that are prone to breaking, tearing, cracking, or peel easily. 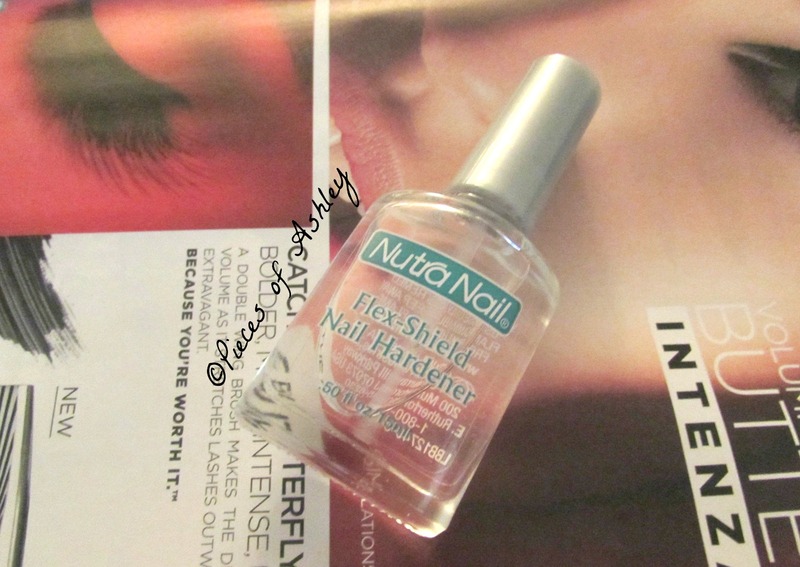 This product coats the with a hard/flexible shield to make the nails strong and help prevent weak unmanageable nails. This will reduce chipping and make it last longer. I have been using this nail hardener for a while now and I am impressed with it. It works really well and my nail polish does not chip. If you're using this by itself then you need to apply two coats. If using this with a polish, apply this as a base coat and a top coat. For the first couple of times, I used this as both a base and top coat. It definitely works great as a base coat, it makes my nails stronger and my nail polish does not chip after a few days. But the downside to this is using it as a top coat. It takes a long time to try and even after about 15 minutes it's still not completely dry. Even my non-quick dry polishes get the job done in less than 15 minutes. So I tried using one of my top coats on top of that to make it dry quicker. It did dry much faster, but in the end my nail polish had those bubbles that does not look appealing. So if you do get this, I recommend only using it as a base coat and find another top coat. But over all it has helped my nails not chip and my nails to not break! I am so glad I have this and I use it all the time. It cost a little less then $4, but sometimes prices vary. I think it is worth the buy. This has helped my nails. I hope you enjoyed reading this post! Let me know what nail products you're loving! This sounds like a really great product, thanks for your detailed review :) I agree, salon nails are a pain!! Thank you. They are a pain! I am your newest follower from blog hop and I followed you via GFC & Facebook. Thank you so much! I am checking out your blog now! you really do have beautiful nail !cool post.